The new Korniche Slimline Aluminium Roof Lantern is the next generation of aluminium thermally broken roof lanterns. With each component engineered to work perfectly with the next, the outcome is truly game changing. This roof lantern has been elegantly designed to retain traditional features in a contemporary setting. By featuring the slim sections and essentially marrying them almost seemlessly together with hidding fixings, the beautiful sight-lines flow unbroken and gracefully from the ridge down through the spas. Meticulously designed using the state of the art CAD software, the Korniche roof lantern is undoubtedly the strongest and stiffest roof lantern on the market. Due to the strong and robust aluminium lugs that have been engineered to adjoin the profiles and coupled with internal bracing in the ridge and eaves sections, you will find that the resulting strength is unparalleled. 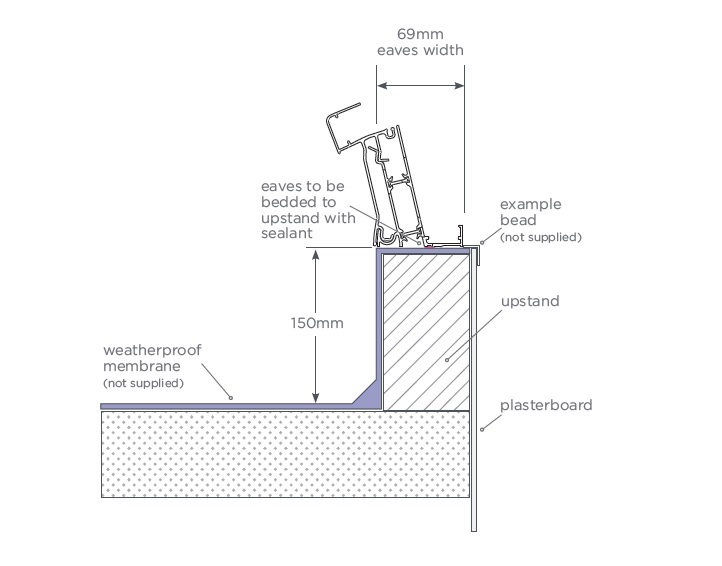 By completely isolating the external aluminium profiles from the internal ones, cold bridging is eliminated. This allows for your room to stay cool in the summer and warm in the winter. Combined with high performance roof glazing, the Korniche's ability to reduce heat transer is in a class of its own. By keeping the rain and wind out, you are able to maintain a comfortable environment inside the home. With the use of market leading Q-LON Gaskets and cleverly designed LSR Seals, the Korniche may have the best level of sealing of any lantern or conservatory roof currently available on the market. Alongside this, the Korniche has been designed so that you only need to use additional silicone sealent between the existing roof upstand and the eaves beam, ultimately reducing the installation time in comparison to other roof lanterns. Whilst the Korniche roof lantern is breaking the boundaries in terms of aesthetics, strength, thermals and weather performance, it is also setting new standards for ease and speed of installation. Due to the simplicity of the design as well as the limited requirement for additional silicone sealent, each roof lantern can be assembled in a fraction of the time needed for any other system. With the Korniche roof lantern, you will not require a full toolbox to complete installation. Developed to be easy and quick to install, the Korniche only requires a cordless screwdriver to fasten all the fixings. Apart from the screws fastening the eaves beam to the upstand, the only other fixings are all 5mm hex button head screws, which we even supply the torx driver bit for in each kit. The Korniche Slimline Aluminium Roof Lantern is delivered as a kit, with all parts securely wrapped and boxed accompanied with an easy to follow, step by step installation guide to allow for a quick and efficient installation of the lantern roof. Precision fabrication and manufacturing processes means the Korniche requires very few tools and less installation time. Please Also Note: All images displayed are for illustrative purposes only. Please contact our sales office if you require a specific design. Please Also Note: Additional charges may apply dependent on delivery location. Please contact our sales office for further information. Bespoke sizes and optional extras available upon request.